Stunning Pill Box Hat by Leading Milliner Gina Foster - This hat is called "Coco" from her La Parfumerie Collection. 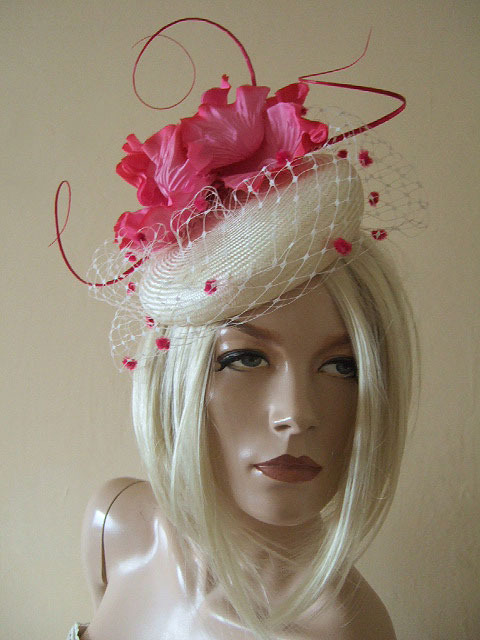 Cream Straw Pillbox base, with large brilliant pink silk Flowers arrangement, cream veiling with pink chenile spots, and curled bright pink ostrich quills. Attaches by elastic under the headpiece that wraps under your hair. Pillbox Measures 8.5" x 7.5".